It is expected that auction activity will remain relatively steady over the week across the combined capital cities, with volumes set to see only a slight decrease week-on-week. There are 2,668 combined capital city auctions currently being tracked by CoreLogic this week, decreasing from the 2,824 auctions held last week, and higher than the 2,480 auctions reported over the same period last year. Across Melbourne and Sydney, volumes are set to be lower, with 1,238 Melbourne properties scheduled to go to auction, down slightly from 1,326 last week, and 1,043 auctions to be held across Sydney, decreasing from 1,075 last week. However, as the week progresses some upward revision is expected and with volumes appearing to remain relatively steady over the week, final results could move either way. Victoria has the busiest suburbs for auctions across the nation this week, with 23 and 20 residential homes set to go under the hammer in Elwood and Kew respectively, followed closely by Brighton and Reservoir each set to host 18 auctions. The combined capital city final auction clearance rate increased slightly to 73.1 per cent last week, up from the previous week when the final clearance rate was 72.8 per cent, with the number of auctions increasing over the week. 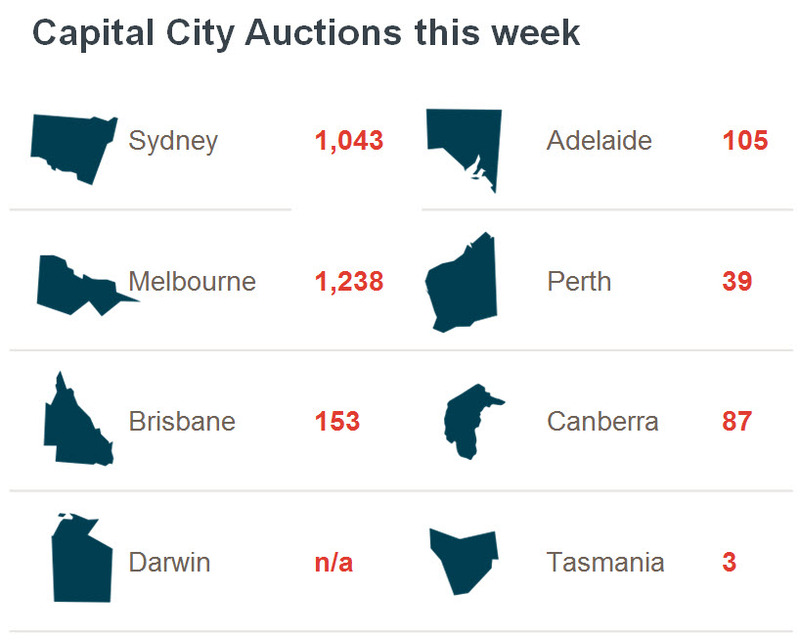 There were 2,824 capital city auctions last week, increasing from 2,409 the previous week. Both clearance rate and auction volumes were significantly higher than the corresponding week last year when a clearance rate of 68.9 per cent was recorded across 1,920 auctions. Last week saw Melbourne’s final clearance rate rise to 77.9 per cent, from 75.0 per cent the previous week. Across Sydney, the final clearance rate fell slightly to 74.0 per cent, down from 74.5 per cent the previous week. Both Melbourne and Sydney saw an increase in the number of auctions held over the week (1,326 and 1,075). Across the smaller auction markets, clearance rates increased in Canberra and Tasmania, while Adelaide, Brisbane and Perth saw a decrease last week. The Hunter region was the busiest non-capital city region last week, with 48 auctions; however Hunter recorded the strongest clearance rate at 81.3 per cent.